For the wine enthusiast or the one who is just crazy for horses, this is the perfect gift from KY! 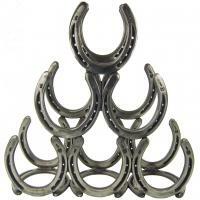 Made from authentic forged steel horseshoes, this is a sturdy work of art for the kitchen, wine cellar, or office! This makes a great corporate gift for that keynote speaker visiting from out of town.